Springs Surreal celebrates the work of four Colorado Springs-based artists, each working within the realms of dreamscape, fantasy, ready-made, and chance. These artists are looking to their Surrealist predecessors and at the same time personalizing and contemporizing the philosophies that defined the movement during its inception during the early 20th century between World Wars I and II, taking form first in literature then in visual arts. Surrealism’s celebration of imagination and liberation of the creative process remain a vibrant component of contemporary art and sustains a thriving legacy as seen through the work of the four regional artists represented in Springs Surreal. These artists cleverly represent the landscape of the subconscious psyche and natural conflicts between order, chaos, and chance via unexpected materials and subjects, questioning long standing beliefs about art, ourselves, and the world around us – questions that only the viewers can answer for themselves. The subjective experiences imagined by the artists and materialized within the exhibition may be both foreign and familiar, an ongoing fascination with concepts, imagery, and sensations that remain challenging to communicate without the language of visual art. 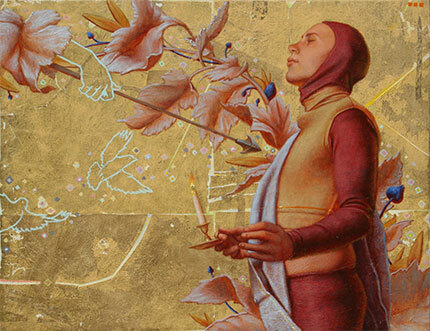 Chris Sedgwick was born in Florida in 1981 and began painting at a young age. He graduated from Florida State University and began a career in painting after moving to Asheville, North Carolina. His inspiration spans from the spiritual to the scientific and his work often evokes intense emotional responses. His work is in numerous private collections worldwide and his housed in the permanent collections of Richard Kessler, Florida State University and Western Carolina University. Sedgwick shares his time between the mountains of Colorado and western North Carolina; drawing inspiration from the natural beauty of both regions.